This CD is a recording of a phone parenting class with Naomi Aldort, recorded in March 2008. Several parents ask questions about their own lives, and receive eye opening answers from Naomi. Track 2: When do power games end? 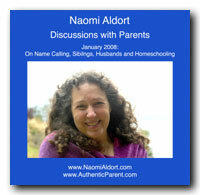 This CD is a recording of a phone parenting class with Naomi Aldort, recorded in January 2008. Several parents ask questions about their own lives, and receive eye opening answers from Naomi.